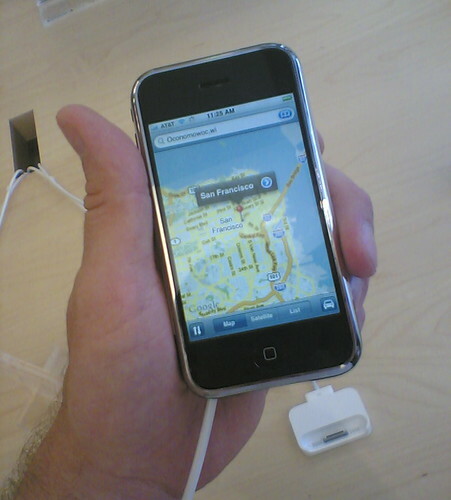 I took a look at the iPhone when I stopped by the new Apple Store at Bayshore. It’s a nice device. I’m not about to replace my Nokia 7610 and 5th Gen iPod with it, but I can see the appeal of this device. Sadly, as with many location-based services, we in the Midwest have some, uh, issues. The iPhone was easily able to locate San Francisco, but couldn’t find Oconomowoc, Wisconsin. I know we’re not in Silicon Valley, but we still exist out here. I know at least one person in Milwaukee with an iPhone. I should ask him how the location stuff works here. He’s already mentioned that he’s aware that it’s a 1.0 device, but it’s still freakin’ amazing. Posted on Monday, July 16th, 2007 at 8:00 am. Subscribe to the comments feed. Both comments and pings are currently closed. Post on your own blog. I’m another Milwaukee iPhone owner who’s pretty happy (although not happy with the 3 day activation wait and mix up AT&T caused). I’d be more happy with a ‘disk mode’ like in the iPod, but I bet it’ll come in a software update. You can sorta spoof GPS if you do a search for where you are at the moment, then do a search for “coffee” or something. Plenty of Starbucks in the area show up… for example. I’m too poor to search for calamari.